Going hunting without a knife is like going out in the rain without an umbrella. You'll enjoy the rain but you won't make the most out of it. You need to pick the best knife for hunting before you make any other plans to do so. If you ask a layman about pocket knives, they will tell you about three basic types- a jack knife, a penknife, and multi -purpose knife. A jack knife is most popular among hunters and fishermen while a pen knife is good if you want more than one type of blade. Lock Blade Knife- As the name goes, when the blade is fully open it locks itself in. You'll need to release the blade and press a lever for closing the knife. Such knives are generally used for heavy duty. Slip Joint Knife- These knives don't have a lock but instead they have a spring that allows the blade to fold when pressure is applied to it. These knives are best suited for light use. Friction Folder Knife- These are another type of non -lock blades. They make use of friction between the blade and the scales to keep the blade in open position. One -handed opening- Such blades have a button installed that allows you to open the blade with just one click or press. These are the easiest knives available in the market today. 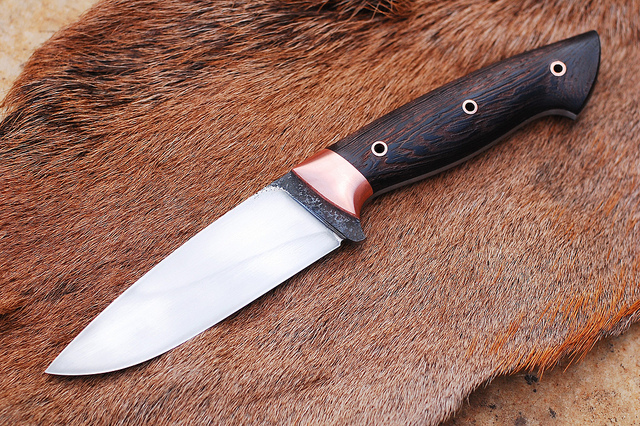 Everyone has a different opinion when you ask them about the best hunting knife. There is an endless list of styles, types, and characteristics to choose from. There are fixed blade knives, fold -up knives; there are many varieties of serrated blades, skinners, flayers and some knives even come with a pre -installed gut hook that makes dressing a lot easier. Some blades are heavy while others are wispy. Some are made of high carbon steel while other are made of softer steel. There are just too many things to confuse even the best of minds. Some hunters prefer a fixed blade knife to carry with them while some may even carry a foldable pocket knife with them. Choosing from a fixed blade knife and a foldable knife is completely dependent on your preference. If you go for a fixed blade, you may have to get a separate case for it while a pocket knife can go anywhere. Choose a knife that does not have a built-in locking mechanism. You don't want the knife to accidentally fold up while you are using it. (Think of the mess! )A big sized knife can prove to be cumbersome for hunting purposes so choose a small sized knife. High carbon steel blades are easy to maintain while those with chrome -plating get dull with time and it gets very hard to get the edge back. You will want a knife with an upward curve in its blade. This will make the job of skinning easier. The knife also needs to have a well-defined point. Such blades will be best for multi -purpose. Lastly, the handle must have sort of non -slip texture. Rough handles are less prone to accidents. Once you have made the difficult choice of the knife you want to own, it all comes down to knowing how to take care of it. If you are making an investment on a knife and you want to enjoy the benefits for many years, keep the following points in mind. Maintaining a hunting knife can be tiring at times but if you want to stay at the top of the game, you need to pay attention. Firstly, keep the blade clean at all times. Wash it after every use and sterilize it as frequently as possible. Hunting knives are not be used as screwdrivers or for purposes other than hunting. This will only shorten the lifespan of your dear blade. Always be sure to maintain the edge of your knife, keep it as sharp as possible. Sharp knives are always easy to use. Store the knife in an area that is not humid and free from objects that may bang against it. Lastly, keep your hunting knife lubricated. This keeps the blade from getting rusty and unattractive. Use soap and water to cleanse the knife with your hands. Use a cloth that will not leave scratches to dry the knife. Do it immediately after washing the knife. This will keep the blade from scraping. Do not use strong cleaning substances that may affect the knife. Use a blend of vinegar and salt to remove strong stains. You can use a cork to apply this blend. Once you have done this, clean the knife with soapy water and dry it with a soft cloth. Store it in a clean and dry place. Even if you have simply held the knife, you must clean it before storing. Sweat can lead to rust. Thoroughly disinfect and clean the knife after each use. You don't want blood and tissues stuck in the folding mechanism for your knife. The same goes for fixed blade knives too. Don't go by the looks of a knife, when you are gutting the prey, a smooth, slippery handle will make the job very difficult. So choose a sure -handed, perfect sized blade of your choice. Knives get dull no matter how you use them. So, no matter what type of blade you choose, always keep them razor-sharp. A blade without the perfect edge is of no knife. Hey Jack Wilder, you have written that Even if you have simply held the knife, you must clean it before storing. Sweat can lead to rust. Is there any way that can not make a knife be rust? After all thank you for your useful article.